Website front page on Mar. 20, 2011. 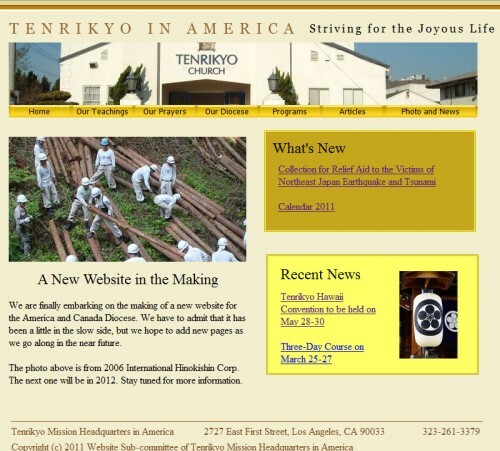 The Tenrikyo Mission Headquarters in America website has been updated. I cannot say when was the website had changed; however, I noticed the change after the announcement that donations to the Tenrikyo Church Headquarters’ efforts to help those who suffered from the earthquake in Japan were being accepted. I got curious and researched the history of this website. The website is definitely improved from its previous installment which was left unchanged for about 5 years. It currently has a lot of pages, mostly filled. Though, a few remain with the text, “Under Construction.” I like the new look and drop-menus, but I’m very concerned because the site was built using, probably, Dreamweaver. If the website intends to make frequent and consistent updates, I highly suggest using a CMS like WordPress. Thinking back on what 5 years meant, I really got interested on what this website looked like and how it changed. So I went to the WayBackMachine. While it couldn’t store images very well, it still has all the text in place. The second update on the website in Apr. 24, 2003. I instantly found that the first sighting of the website was on November 28, 1999. Please note that these dates are approximate. I don’t know the pattern in which the “WayBackMachine” collected information on websites, but it is as accurate as I can get. 1999, Nov. 28 – First sighting. 2000, May 19 – First update. 2001, Apr. 1 – Under construction notice up. – Second update. Construction notice that was up for 2 years was taken down. The front page looked nice but there were only a few pages. Cool animated gif image! 2003, Dec. 25 – More pages. Hamilton Niwa was chair of YMA and I can see that an “Internet Committee” was established. Cool… it’s 2011 and Hawaii still doesn’t have one of those. 2005, Feb. 10 – Third update. It just remained this way for quite some time. I was surprised to see it unchanged, even after the Tenri Forum 2006. 2011, Mar. 20 – Now. Congrats! On time to update on accepting donations for disaster efforts. Well, there you have it. The history of the Tenrikyo Mission Headquarters in America website.